Invite me to a cookout and you can bet I'll offer to bring dessert. I love to bake and pride myself on my knowledge of making a wide variety of desserts. And what's a cookout anyway without dessert? 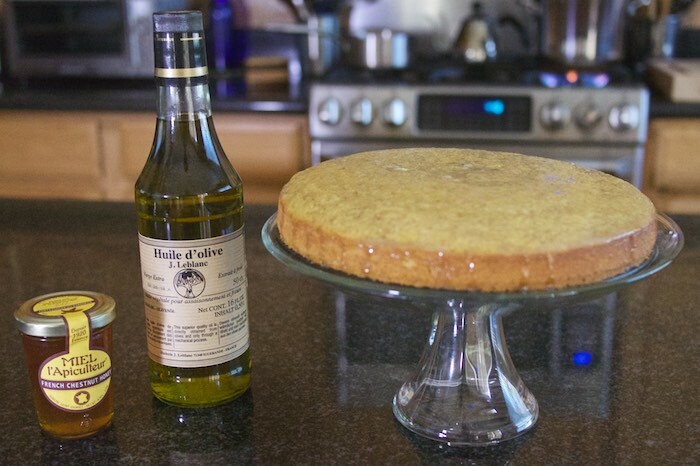 So, in honor of #cookoutweek, a week long celebration where participating food bloggers share their all-time favorite recipes perfect for a summer cookout, I'm giving you this delicious and easy to make Olive Oil Honey Cake. The cake features a French olive oil and chestnut honey from The French Farm, an online store offering the finest imported gourmet foods and kitchen accessories. The French Farm is a wonderful website allowing the shopper to experience and taste the best of an area without having to leave the house. I would recommend them when looking for that traditional European ingredient you just can't find anywhere else. While the olive oil adds a subtle fruity taste the chestnut honey adds a rich aromatic flavor resulting in a phenomenal cake with earthy undertones. I loved being able to get both of these fabulous ingredients in one place through The French Farm's online store and I think you will too! Preheat the oven to 350°F. Grease and flour a 9-inch round springform pan and set aside. Crack the eggs into a large mixing bowl. Add the sugar to the bowl and whisk, thoroughly. Add the olive oil and whisk until it turns light yellow and has thickened slightly, about 1 to 2 minutes. Add the extracts and orange juice. Add the dry ingredients to the bowl and whisk until they are thoroughly combined; continue whisking an additional 30 seconds. Pour the batter into the prepared pan, and bake the cake for 30 to 45 minutes, rotating the cake pan halfway through. The cake is done when it has begun to pull away from the sides of the pan, springs back slightly when touched, and a cake tester comes out clean. Allow the cake to cool for ten minutes in the pan, then gently remove it from the pan and allow it cool completely on a rack. Brush with honey glaze and serve. Mix together until combined. Using a pastry brush cover the entire top of cake with honey glaze, allowing it to drip over the sides when possible. Special thanks to The French Farms for sponsoring this post and to The Pinterest Kitchen for hosting the event. That just sounds unbelievably good! Such unique flavors and not too sweet! My kind of dessert! I discovered this cake on Facebook earlier and had to come tell you how wonderful it looks! I have only had olive oil cake once before but it was really delicious and this one looks great! I am going to pin this recipe for later and we will give it a try! Thanks for sharing it! thank you so much! I hope you will love it as much as I do! This cake looks delicious, perfect to have with a cup of tea. I love the combination of almond and orange flavors in this! Sounds absolutely wonderful :) Thanks for sharing! A simple cake with quality ingredients sounds amazing! What a delicious way to end a summer meal! I've seen olive oil cakes around but haven't ever tried making one--this looks so good! :] I love the sound of that chestnut honey glaze too! I know I would love this cake...not too sweet and no frosting....perfect in my humble opinion. This looks delicious. I love olive oil cake. This one is just sheer perfection. I love baking with olive oil and that chestnut honey sounds soooo good! That chestnut honey intrigues me. I just made an olive oil cake as well and they are so good!! Never heard of chestnut honey before. Love that you added some almond meal in the cake! Well, that just sounds amazing! I love to take desserts to cookouts too! That's pretty much the only thing I ever take and I bet this cake would be a hit! I don't think I've ever baked with olive oil although I've been meaning too. Looks great!